Small, silent, transportable and a very low power consumption. That's the Intel NUC. 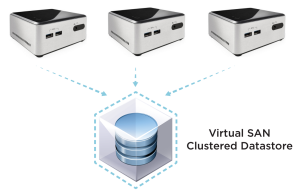 It's not only a great system for Homelabs, or Homeservers - It can also be used to build a portable Virtual SAN Cluster. I ordered 3 NUCs to build a VMware Virtual SAN enabled Cluster. VMware does only support enterprise hardware. Intel NUC is not on their HCL so you won't get support in case of failures. Do not put sensitive data to your NUC Virtual SAN without backup and do not run productive systems on it. Installation with the images provided by VMware fails with an "No Network Adapters" error messsage. Due to the missing drivers you have to create a Customized ESXi Image. Each NUC has a Core i5-4250U CPU (2x 2.6 GHz) and 16GB of RAM. This should be enough for a couple of Virtual Machines. The limiting factor will be of course the 1Gb Ethernet Adapter. Write performance will not be great because all disk traffic has to pass the 1Gb NIC. 3 Windows and 9 Linux Virtual Machines are currently active at my NUC Cluster. They do perform without issues. The total power consumption of the lab (3 NUCs and 8Port Switch) is about 150W. you're gonna have trouble with that AHCI controller eventually - queuing problems will eventually knock nodes offline, so watch carefully. Actually if I remember correctly there is a Thunderbolt switch that could be used as a 10GB ethernet connection between these devices. I don't have links but I remember someone mentioning it. As far as i know, the only NUC with Thunderbolt is the DC3217BY. It is a Gen3 NUC (Ivy Bridge) reviewed here. The new NUCs do not have a Thunderbolt port. I do have 2 nuc's with the ssd and hgst drive. Activating virtual san requires both disks. No, you can't use a Virtual SAN enabled SSD as VMFS datastore. Am I correct, after your vmware trial expires, you'll need a vCenter server license? Yes. vCenter, Hypervisor Socket and Virtual SAN license to be exact. This is of course for demonstration purposes only. You do not have to buy licenses for that. Any way to get vsan running with one ssd per host, or are two drives absolutely required? I wonder if anyone have tried 6.5.0 update 1 on a 3-node NUC cluster. Meanwhile, none-VSAN node consume only 1.5G Ram. Great Post :) Thank you for review.